It's that time of year again, my friends. I'm knee-deep in planning my upcoming international trip for summer 2017. Then, I'll head off on my own while they head home. 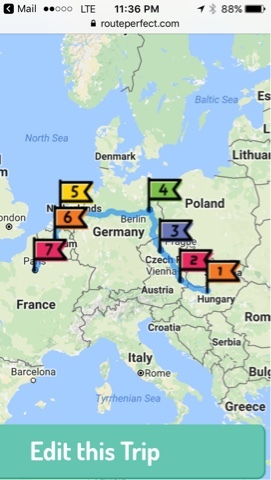 To do that, I'll need to take a short flight via a European airline from Paris to Budapest to begin my grand adventure. At the end of my stay, I'll take the train to Vienna, a trip of 1.5 - 2.5 hours. I'll probably make this trip in the late afternoon or early evening, but I'll still want to make my arrival before nightfall. At the end of my stay, I'll take the train to Prague, a trip of about 4 hours. Because this is a longer trip, I'll probably catch the train mid-afternoon. At the end of my stay, I'll take the train to Berlin, a trip of about 4.5 hours. Because this is a longer trip, I'll probably catch the train mid-afternoon. At the end of my stay, I'll take the train to Amsterdam, a trip of about 4.5-6.5 hours. Because this is a longer trip, I'll probably catch the train mid-afternoon. 5 days - I've visited here once before, but we were only here for about a day and a half. At the end of my stay, I'll take the train to Brussels or Bruges, a trip of 2-3.5 hours. I'll probably make this trip in the late afternoon or early evening, but I'll still want to make my arrival before nightfall. At the end of my stay, I'll take the train to Paris, a trip of about 1.5 hours. I'll probably make this trip in the late afternoon or early evening, but I'll still want to make my arrival before nightfall. 3 days - I stayed here for six weeks in 2015, but I still didn't manage to see/do everything. At the end of my stay, I'll take a taxi or uber or metro to the airport, generally a trip of about 45 minutes from inside the city. What time of day I leave will totally depend on my flight plans. That's the plan at this point. I'm quite excited, but I know the logistics of planning it will be challenging. What do you think of my plan? When you're in Freiburg you'll be only 60 miles away from where I live (across the Black Forest - Rottweil), but I guess your schedule will be too tight for a meetup. Your travel plan looks fascinating, but I think you might need a couple of weeks to recover from all that traveling around ;). I'm excited to read more about your plans, and if you have any questions, feel free to ask! That's very ambitious. What made you decide to go this route instead of a long stay in place? Anyway you would want to travel with a pudgy adult size steamer trunk containing a pudgy but fun adult inside? Sounds soooo exciting, but a lot of packing and unpacking? Such a great way to check those countries off your to do list tho, right? I assume you felt you stayed to long in sweltering Madrid? Tiffany, this sounds like a very exciting and exhausting trip. Good for you! Your trip sounds wonderful! I lived in Germany for 12 years; my daughter was born in Heidelberg. Been to several places you have on your list! I think you will enjoy! I think it's a fabulous plan. You will be in each city for almost a week which gives you time to explore and to relax and soak in the city. Get your city maps and Rick Steves books from the library. You have a lot to plan!! Sounds wonderful! Coincidentally I've just booked 3 weeks in Europe visiting my daughter in Belgium and then southern Germany for 2 weeks including many of the places you're taking your students. I'm going in March though so it'll still be pretty cold! This looks jam packed with adventure. Are you planning down time? I know when I am somewhere I want to do and see the sites, but after the tour with kids, I would want more of a break. I personally would drop 1-2 cities and have a slower pace, but I am not as well travelled as you. So maybe this is doable for you and the sites you plan to see in each city. Wow! This looks exciting, do-able... and exhausting! I agree that you might need to think about a day per location for just hanging around and recovering, but since you've given yourself nearly a week in each place that should allow for some less hectic moments. I'd love to meet up and show you round Brussels/Bruges if you need a guide or some company. I think this sounds like a delightful whirlwind of adventure and I'm impressed with your zest for life and the amount of energy it would take to do this. I look forward to living vicariously through you this summer. I appreciated you sharing pictures with your followers last year. Maybe your decision to move around rather than stay in one or two places could be a topic of discussion in a youtube video? So looking forward to your take on this trip/cities. My hubs and i are thinking of taking one of those river cruises, like PBS advertizes on the Rhein.